Whether for display in the bathroom at home or on your desk at work, there’s nothing that says fun and relaxation like the classic rubber ducky. At ePromos, we have a whole bucket full of bath time buddies – from iconic yellow quackers to custom rubber ducks fitted in the uniforms of some of the most noble occupations. Find your favorite from our selection, and our experts will work with you to design a toy that’s exclusive to your brand. 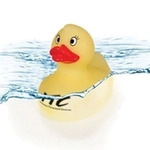 Get in touch with us today for a promotional rubber duck that really fits the bill! They'll go quackers over this Custom Rubber Duck with your logo! For a hot logo'd gift, look no further than this fire-fighting Fireman Promotional Rubber Duck! Your logo won't blend in with this Camouflage Custom Rubber Duck. Customized rubber ducks are classic toys that will be well-recieved by all. Bring back childhood memories and smiles this adorable large promotional rubber duck! They'll go quackers over this Soccer Ball Custom Rubber Duck with your logo! The unique Mood Color Changing Custom Rubber Duck changes color when water temperature reaches 38 degrees C /100 degrees F.
Build your brand with this imprintable Construction Worker Custom Rubber Ducky. They'll go quackers over this Baseball Custom Rubber Duck with your logo! This Doctor custom Rubber Duck is just what the doctor ordered. They'll go quackers over this Basketball Custom Rubber Duck with your team logo! Make your logo stand up in a crowd with this Graduating Custom Rubber Duck. Are you are looking for a fun promotion? Look no further than one of the world’s historic toys. Personalized rubber ducks became popular in the late 19th Century. Using Charles Goodyear’s invention, vulcanized rubber, ducks were make of hard rubber and didn’t float. They were created as chew toys. Later, adding to their fame, was Ernie, a popular Muppet from Sesame Street. He performed the song “Rubber Duckie” and the rest is history. Yes, the rubber duck is actually a part of history. In 2013, rubber ducks were inducted into the Toy Hall of Fame. Now you can bring back childhood memories and smiles by advertising your business with an adorable, infamous, stress-relieving promotional tool. Great for children and grownups alike, these sought-after, collectible, genuine rubber ducks (with your logo imprinted on their feathery breast) will give your promotions a unique twist. Each one will be appreciated at corporate picnics, school carnivals, scouting events and more. Some of our flock are unique promotional items for sports fans of all ages. Here’s an idea for a sports-related fundraiser. Hold a duck race with one of our basketball, baseball, football or soccer ball customized rubber ducks. Sell a duck to each participant and write their number on the bottom of the ducky. When it’s time for the race, dump all the ducks into the water and watch the ducks until the finish line. In a similar fashion, instead of racing the ducks, have a duck pond. Fill a baby pool, trough or inflatable pool with water and add each duck sold (and numbered) to the pool. After all the ducks are sold, stir up the water, mixing the ducks. Now pick ducks for first, second and third place prizes. All those who did not win still get to keep their duck. Fowl dressed in camouflage, little baby ducks, fireman ducks and moody color-changing ducks will be enjoyed when you share them with employees, friends, prospects and the public. Whether your business is young and energetic, or in need of a marketing tactic to help stand out from the crowd, ePromos has the perfect range of fully customizable ducks from which you can choose. Our rubber ducks get noticed wherever they go! To know more about the business benefit of these toys and discuss the perfect imprint for your campaign, feel free to contact a Brand Consultant. You are guaranteed 100% customer satisfaction!